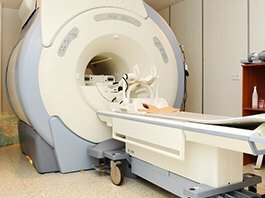 Unlike X-rays that use radiation, an MRI (Magnetic Resonance Imaging) is a safe, painless, non-invasive procedure that uses strong magnetic fields and high frequency radio waves to produce a three-dimensional image. Your physician may order an MRI to evaluate structures within your body not visible by routine X-rays. Arlington Orthopedic Associates has three of the latest-technology MRI machines – each of which provides a comfortable exam, especially for claustrophobic patients. Your physician will recommend using whichever machine will be most beneficial in diagnosing your problem. An MRI requires no preparation; however, a patient should arrive 15 minutes prior to the scheduled exam time in order to complete all appropriate paperwork. The length of the appointment depends on the type of scan, but generally takes about 60 minutes. To expedite the exam process, a patient should wear comfortable clothing that is free of metal. Shorts or a gown will be provided if this is not possible. Fractured bones with rods, screws, etc. Most often there are no injections, but if the physician is looking for something in particular, the radiologist may put a small amount of contrast material into a joint or area to be examined. For most examinations, the patient lies still for about 30 to 45 minutes and the test is done. Severe moving while the MRI test is in use may cause the test to be repeated, thus delaying examination time. Once the scan is complete, the image will be reviewed by a radiologist and the results of the scan will be discussed with your physician. This process generally takes 24 to 28 hours.